SUMMARY: The neuropathologic diagnosis of brain tumors entails the microscopic examination of conventional formalin-fixed paraffin-embedded tissue samples surgically removed from a radiographically defined lesion. A preliminary diagnosis is often rendered with frozen sections, though the final or definitive diagnosis usually requires more elaborate studies. Typically, the tissue is first fixed for a minimum of several hours in 10% neutral buffered formalin, processed through a series of dehydrating and clearing reagents, and embedded in a hardening wax, such as paraffin. The latter enables the tissue to be thinly sliced with a microtome, transferred to a glass slide, and then stained with dyes such as hematoxylin-eosin (H&E) that contrast the different cellular elements. Pathologists rely on visual clues such as pattern recognition when examining the stained tissue with a microscope, much as radiologists rely on gray-scale patterns of densities and intensities on images. Some histologic patterns of cellular architecture are distinctive if not pathognomonic, whereas others are less specific, but nevertheless considerably narrow the differential diagnosis. The precise biologic bases for some of the observed microscopic patterns are poorly understood, though their recognition remains useful nonetheless. Although more advanced methods of tissue examination—such as histochemical and immunohistochemical profiling, genetic analysis, and electron microscopy—have been developed, the microscopic review of H&E–stained material remains a critical component of tumor diagnosis. One commonly encountered neuropathologic histologic architectural pattern seen within certain tumors is the rosette. The purpose of this report is to review the patterns of rosettes and pseudorosettes in the context of such tumors as medulloblastoma/primitive neuroectodermal tumor (PNET), retinoblastoma, ependymoma, central neurocytoma, and pineocytoma. Rosettes consist of a halo or spoke-wheel arrangement of cells surrounding a central core or hub (Fig 1). 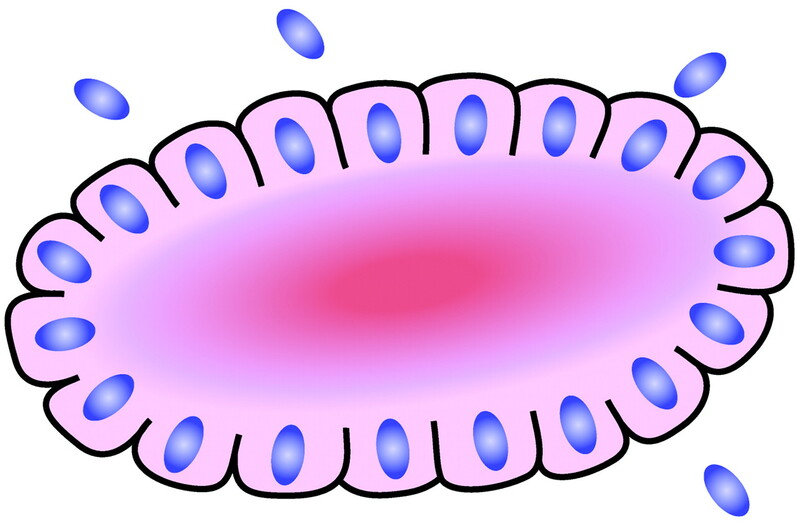 The central hub may consist of an empty-appearing lumen or a space filled with cytoplasmic processes. 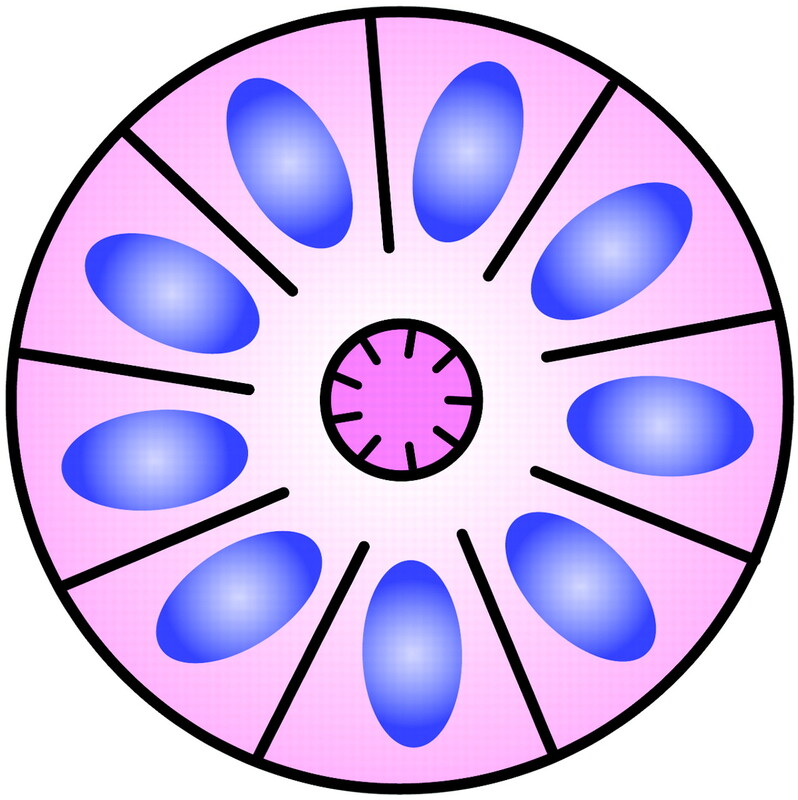 The cytoplasm of each of the cells in the rosette is often wedge-shaped with the apex directed toward the central core; the nuclei of the cells participating in the rosette are peripherally positioned and form a ring or halo around the hub.1,2 Named for the flower-like architectural ornament, this pattern resembles the rose windows found in many gothic cathedrals (Fig 2). Rosettes may be considered primary or secondary manifestations of tumor architecture. Primary rosettes form as a characteristic growth pattern of a given tumor type, whereas secondary rosettes result from the influence of external factors on tumor growth. 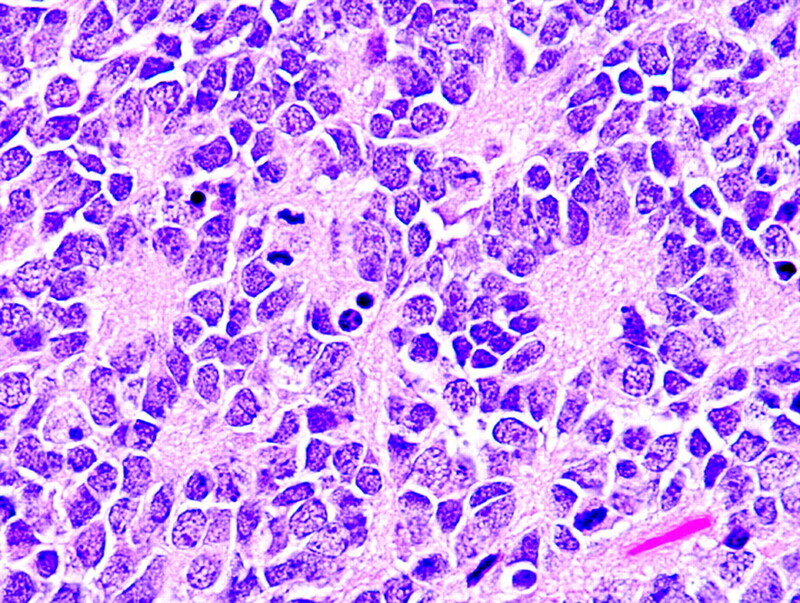 For example, in the latter instance, regressive cell swelling may centripetally displace the cytoplasm as the nucleus is squeezed to the periphery.2 Although the presence of primary rosettes may suggest a given diagnosis, usually this finding alone is not considered absolutely pathognomic for one specific tumor type. Ambiguous terminology and descriptions in the past have added to confusion of the usage of the term; however, several types of primary rosettes are generally recognized in the pathology literature. The typical Homer Wright rosette with its central lumen or hub filled with fiber-like processes can also be found in medulloblastomas and histologically similar tumors occurring outside of the cerebellum, designated PNETs (Fig 4⇓). Although the cellular mechanisms responsible for the formation of rosettes within medulloblastomas and the significance of these rosettes are not fully understood, most investigators believe that their presence indicates neuronal differentiation.5,6 The delicate fibrillary material found within the central lumen of the Homer Wright rosette is composed of neuropil, which contains primitive neuronal processes or neurites. Although most medulloblastomas are considered primitive, variable degrees of differentiation are nearly always encountered at the microscopic, immunohistochemical, and ultrastructural level.5–7 Moreover, some medulloblastoma cells in specimens and cultures have demonstrated microtubules, attenuated-core neurosecretory and clear-centered synaptic vesicles, and synaptic junctions, all of which are characteristic of neuroblasts, as well as mature neurons.8,9 Regardless of the medulloblastoma subtype, immunohistochemical evidence of neuronal differentiation is found in nearly all cases with neuronal markers such as synaptophysin, neuron-specific enolase, and neurofilament protein.5,10 Some medulloblastomas may also display other forms of differentiation as demonstrated by the presence of the astrocytic marker glial fibrillary acidic protein.8,11 Skeletal muscle and melanocytic differentiation are considerably less common and define the medullomyoblastoma and melanotic medulloblastoma variants, respectively. Although the identification of Homer Wright rosettes in a posterior fossa tumor is nearly pathognomonic of the diagnosis of medulloblastoma, the rosettes are encountered in only a third of these tumors. Moreover, Homer Wright rosettes may be found in other tumors such as supratentorial PNETs and pineoblastomas.18 For tumors composed of nothing more than primitive-appearing cells, the definitive diagnosis relies on additional techniques such as special stains and immunohistochemical analysis. Another rosette pattern may be demonstrated in a subset of ependymomas and has been termed the “true ependymal rosette”6,29,30 (Fig 7). In contrast to the Homer Wright and the Flexner-Wintersteiner rosettes, the empty-appearing lumen of the true ependymal rosette resembles a tubule lumen and contains no fiber-rich neuropil or central cytoplasmic projections. These tubule-like structures, as well as more elongated versions known as ependymal canals, may represent an attempt by the tumor cells to recapitulate the formation of ventricles with ependymal linings.6,18 This rosette provides strong evidence of ependymal differentiation at the light microscopic level.29 Unfortunately, true ependymal rosettes and canals are found in only a minority of the most well-differentiated ependymomas and most commonly in infratentorial examples29 (Fig 8). 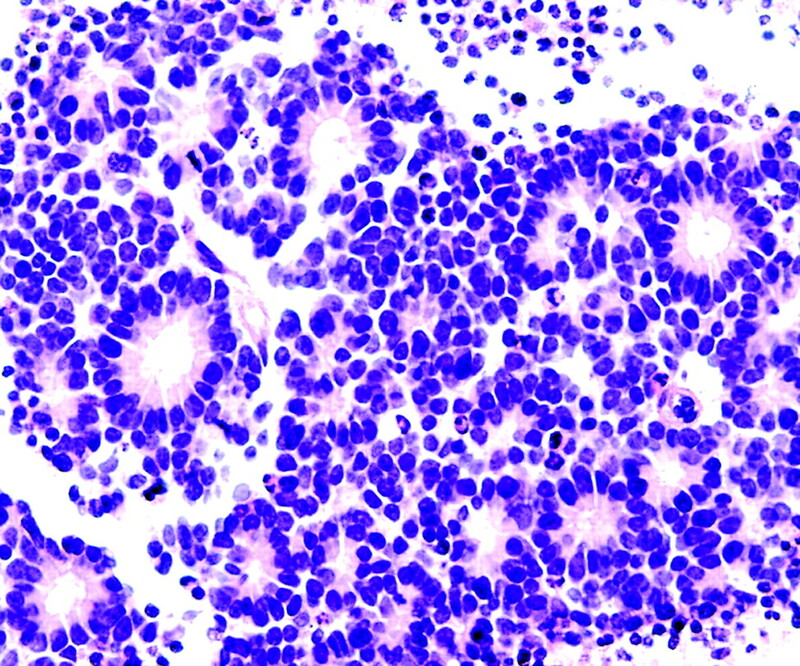 Ironically, a similar structure known as the ependymoblastic rosette is encountered in a rare form of PNET known as ependymoblastoma, where they are thought to denote ependymal differentiation in an otherwise highly primitive malignancy. A fourth type of rosette is the perivascular pseudorosette. 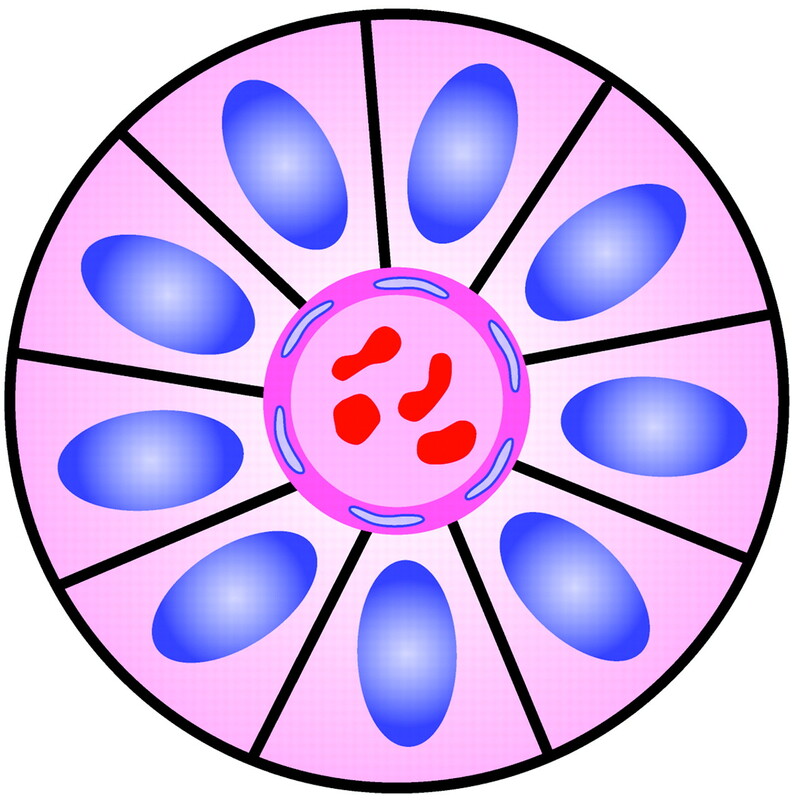 In this pattern, a spoke-wheel arrangement of cells with tapered cellular processes radiates around a wall of a centrally placed vessel2,7,18 (Fig 9). The modifier “pseudo” differentiates this pattern from the Homer Wright and Flexner-Wintersteiner rosettes, perhaps because the central structure is not actually formed by the tumor itself, but instead represents a native, non-neoplastic element. Also, some early investigators argued about the definition of a central lumen, choosing “pseudo” to indicate that the hub was not a true lumen but contained structures.31 Nevertheless, this pattern remains extremely diagnostically useful and the modifier unnecessarily leads to confusion. Perivascular pseudorosettes are encountered in most ependymomas regardless of grade or variant. As such, they are significantly more sensitive for the diagnosis of ependymomas than true ependymal rosettes18,30,32 (Fig 10). Unfortunately, perivascular pseudorosettes are also less specific in that they are also encountered in medulloblastomas, PNETs, central neurocytomas, and less often in glioblastomas, and a rare pediatric tumor, monomorphous pilomyxoid astrocytomas. Pineocytomas and central neurocytomas represent well-differentiated neuronal neoplasms with small rounded nuclei, analogous to those normally encountered in the internal granular layer of the cerebellum or the dentate fascia of the hippocampus. Although they likely originate from slightly different precursors, the histologic features of these 2 tumors are virtually identical, including their tendency to form neuropil-rich rosettes, referred to as pineocytomatous rosettes in pineocytomas and neurocytic rosettes in central neurocytoma (Fig 11). Both are quite similar to the Homer Wright rosette, but they are generally larger and more irregular in contour34 (Fig 12). As in the other types of rosettes discussed, the presence of pineocytomatous or neurocytic rosettes is generally thought to reflect differentiation of the tumor, in this case neuronal.35,36 The cells of the pineocytomatous and neurocytic rosettes are also considered to be much more differentiated than the cells forming Homer Wright rosettes in that the nuclei are slightly larger, more rounded, much less mitotically active, and paler or less hyperchromatic.37 In rare cases, these rosettes may aggregate in a sheet of back-to-back clusters resembling field stone pavement. In summary, rosettes and pseudorosettes represent a histologic architectural pattern seen within specific nervous system tumors (Table). 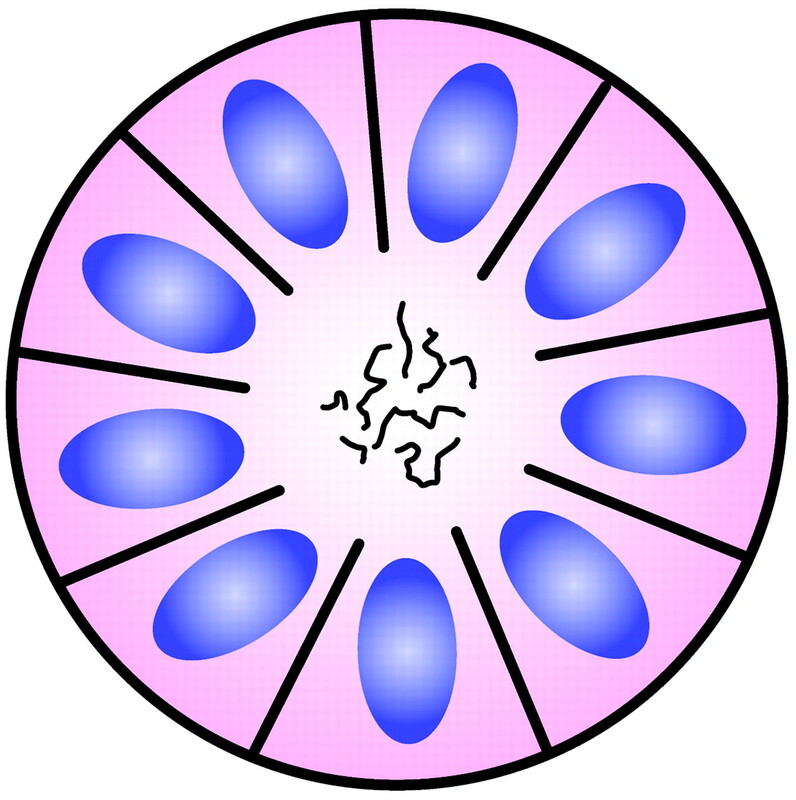 The rosette pattern consists of a halo or spoke-wheel arrangement of cells surrounding a central core or hub which may be empty or contain fibers, cytoplasmic processes, or a blood vessel. Although the significance of the presence of rosettes is not always understood, most authorities agree that they represent various forms of tumor differentiation. The presence of rosettes is rarely if ever pathognomic of a specific tumor, though identification of rosettes is often helpful in the histologic diagnosis of medulloblastoma/PNET, retinoblastoma, ependymoma, central neurocytoma, and pineocytoma. Note: In this issue of the journal a new feature entitled “Special Report” appears. This series of short pathologic descriptions will be written by Jay Wippold and associates at the Washington University School of Medicine. The first of the series deals with rosettes and pseudorosettes and will be followed quarterly by other topics of interest, namely Rosenthal fibers; palisading/pseudopalisading; Alzheimer plaques and tangles; and fluorescence in situ hybridization (FISH). 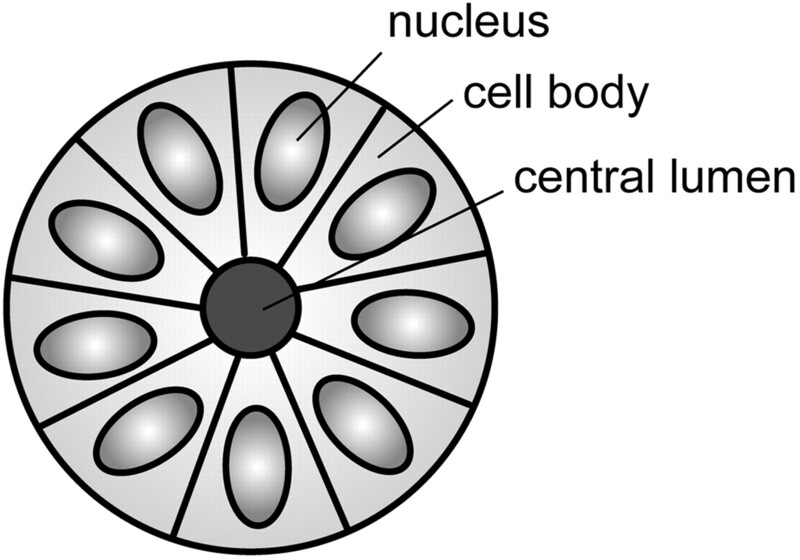 Diagram of a typical rosette demonstrating a halo of cells surrounding a central lumen. Adapted from Ellison et al (2004)34 with permission. 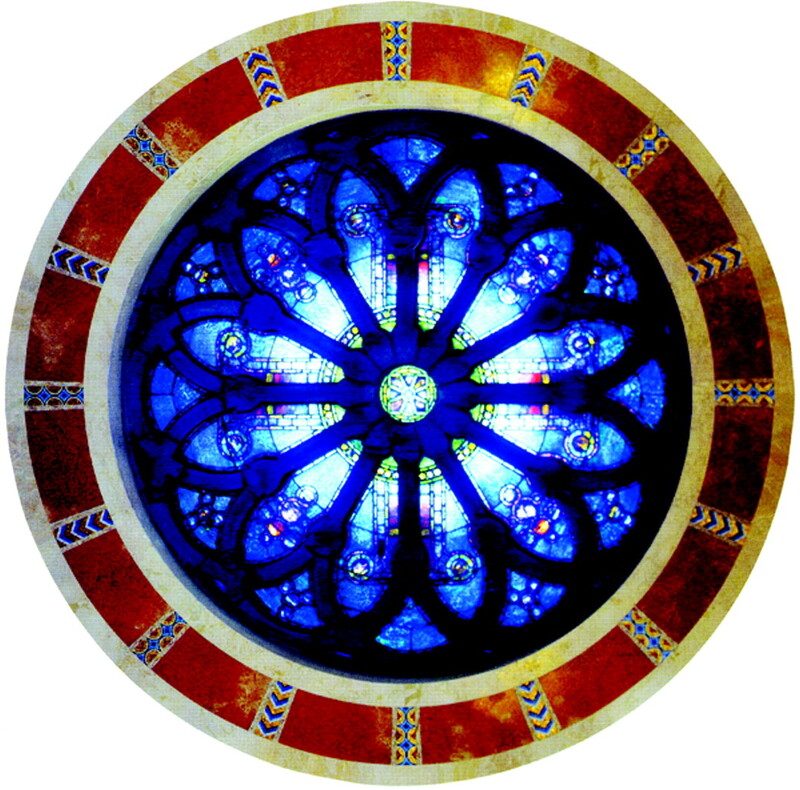 Example of a cathedral rose window. Photo courtesy of the Cathedral Basilica of St. Louis, used with permission. Diagram of Homer Wright rosette. A halo of cells surrounds a central hub that contains a meshwork of fibers. Adapted from Ellison et al (2004)34 with permission. Photomicrograph from a PNET demonstrating multiple Homer Wright rosettes. The halo-like cluster of cells in each rosette surrounds a central area of fiber-rich neuropil (H&E; original magnification 400×). Diagram of Flexner-Wintersteiner rosette. A halo of cells surrounds a largely empty central hub. Small cytoplasmic extensions from the cells project into the lumen. Adapted from Ellison et al (2004)34 with permission. 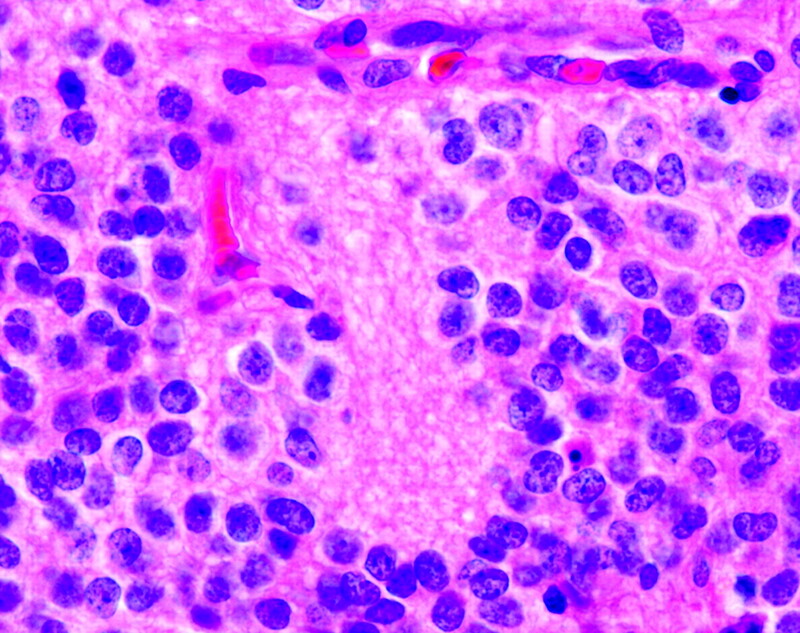 Photomicrograph from a retinoblastoma showing multiple Flexner-Wintersteiner rosettes. The halo-like cluster of cells in each rosette surrounds a nearly empty appearing central lumen containing fine cytoplasmic processes (H&E; original magnification 400×). Photomicrograph generously donated by Dr. Morton Smith, Ophthalmic Pathology, Washington University, St. Louis. Diagram of true ependymal rosette. A halo of cells surrounds an empty lumen. Adapted from Ellison et al (2004)34 with permission. 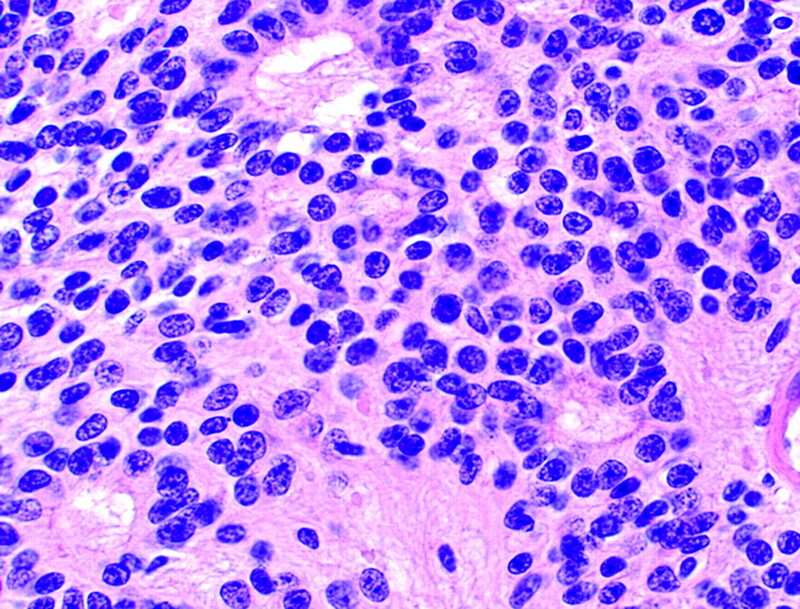 Photomicrograph from an ependymoma showing several true ependymal rosettes. The halo-like cluster of cells in each rosette surrounds an empty central lumen (H&E; original magnification 400×). Diagram of perivascular pseudorosette. A halo of cells surrounds a blood vessel. Adapted from Ellison et al (2004)34 with permission. 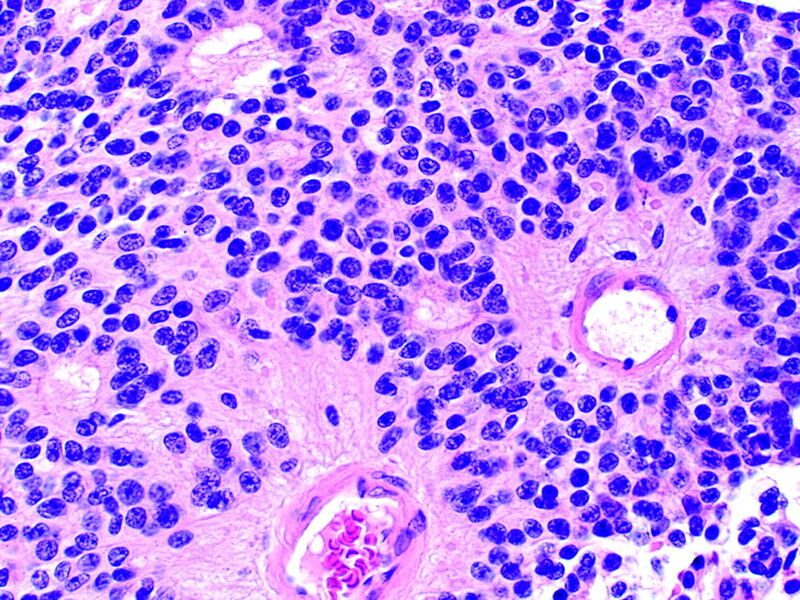 Photomicrograph from an ependymoma showing 2 prominent perivascular pseudorosettes. The halo-like cluster of cells in each rosette surrounds a blood vessel. Note the several smaller true ependymal rosettes (H&E; original magnification 200×). Diagram of neurocytic rosette. This rosette is similar to the Homer Wright rosette, but the central fiber-rich neuropil island is larger and more irregular. Adapted from Ellison et al (2004)34 with permission. Photomicrograph from a central neurocytoma containing an irregularly shaped neurocytic rosette with central neuropil (H&E; original magnification 400×). Accepted after revision July 26, 2005.